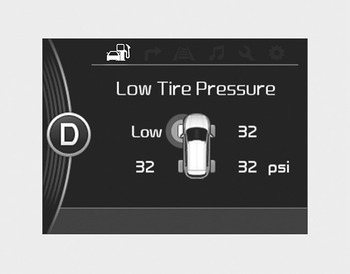 When the tire pressure monitoring system warning indicators are illuminated and warning massage displayed on the cluster LCD display, one or more of your tires is significantly under-inflated. The low tire pressure position telltale light will indicate which tire is significantly under-inflated by illuminating the corresponding position light. If either telltale illuminates, immediately reduce your speed, avoid hard cornering and anticipate increased stopping distances. You should stop and check your tires as soon as possible. Inflate the tires to the proper pressure as indicated on the vehicle’s placard or tire inflation pressure label located on the driver’s side center pillar outer panel. If you cannot reach a service station or if the tire cannot hold the newly added air, replace the low pressure tire with a spare tire. In winter or cold weather, the low tire pressure telltale may illuminate if the tire pressure was adjusted to the recommended tire inflation pressure in warm weather. It does not mean your TPMS is malfunctioning because the decreased temperature leads to a lowering of tire pressure.